Jan 25, 2019 ~ Tuesday was cloudy and relatively warm for January so we headed to the coast. We wanted to get a little birding in before the anticipated cold front. The forecasters were promising snow, then sleet and finally settling on cold miserable rain for the next few days so it felt like it was the last chance for a while. 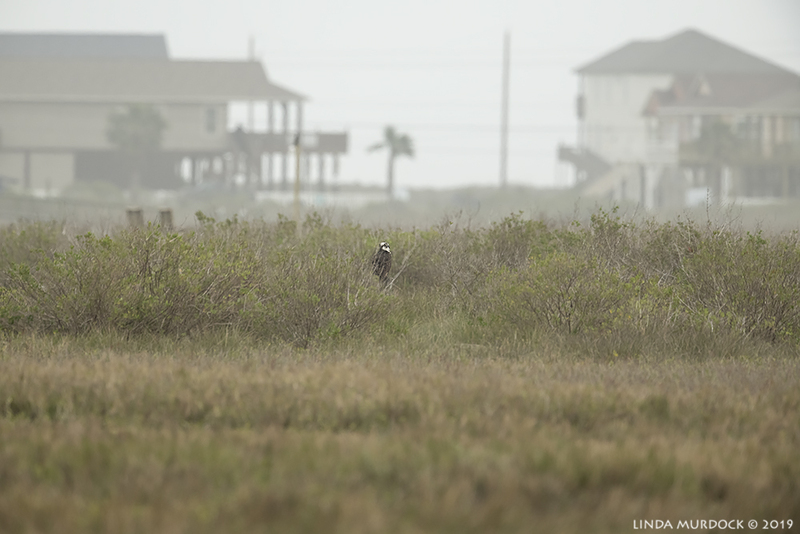 The marshy areas around Surfside Beach, Tx are connected to the Intracoastal Canal so they are affected by the tides but some spots are cut off and rely on rainfall. In fact, it is hard to tell and sometimes we are surprised. When we arrived the water was low with a lot of exposed mudflats. Still, we didn’t see any of the small wading birds. No Clapper Rails or even Willets. Great Blue Heron in the brush. There was a nice looking Great Blue Heron at the end of Casco Road. Note the lores are deepening in color and his chest feathers are looking spiffy. They are some of the earliest birds to nest and breed along the coast. This is the same area where we saw old BW for years. He was quite a successful Great Blue in spite of his broken wing. We saw a lot of Tricolored Herons. This is the same guy in the BIF image at the top. He had been feeding out of sight in a ditch when we stopped to chase a Belted Kingfisher that got away. Bill Maroldo was closer and got a few of him before he flushed and …flew right past me. I followed him as he circled around and finally landed on this telephone cable. Up by Quilty-Guilty Pond Bill got out to shoot another Great Blue Heron. We moved on and had just turned left onto Ft Velesco when I saw something really dark fly across the road and land in a shallow ditch. It flew almost like a rail but seemed bigger. I am saying “cormorant” because it was so dark (thinking all the time …in a ditch? a cormorant?) and Bill is saying “rail” as we rolled to a stop. I jumped out with my big lens to see what it was when… it flew. I got a bunch of shots of him on this low wire, but when he flew away I was just too slow to get any. We found a couple of Kestrels, who either refused to turn around and look at us or were perched along dangerous roadway curves and thus escaped our cameras. Still, it was turning into a really good day. The overcast conditions were holding, it was a bit windy but not cold at all. 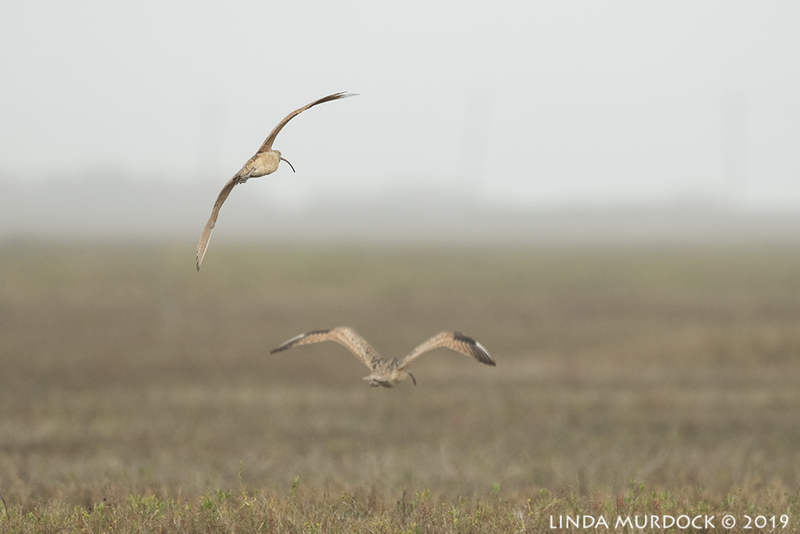 About half-way down on Bay Ave we found a flock of Long-billed Curlews! We have seen small groups before, but generally you will see a solitary bird probing the ground for food. I did get one with a crab but they were not all that cooperative. Hiding behind clumps of glasswort and peeping up at us. Maybe they are young birds on their first trip south? What was heartbreaking was when they flew away. I have dozens of almost-in-focus too-small-in-the-frame BIFs that I can hardly bear to delete. Sigh. At the end of Bay Ave by the boat ramp we did find a muddy Osprey on a short pole. Bill got some shots and I had to wait my turn. Of course he flew off when I got out so we turned our attention to another Tricolored Heron at the end of the boat ramp. He was at the very end and it would have made a great shot with the wooden pier and open water but… by the time I got him in my sights… he flew. I got this, another with half his body in the frame and one with just his feet. I was so tickled with this we could have called it a day right then and there. What is that spec way down there? While I was waiting my turn on the muddy Osprey…. waaaay off in the distance I saw what looked like another Osprey. After the Tricolor flew off, we drove down even with my sighting and parked. Bill carried his 600 f/4 and his tripod out through the glasswort and mud. I decided to skip the tripod and just hand-hold my 500 f/4. I figured we would hike back there, get a couple of shots of him on the post and he would fly. The perched Osprey let us get within 30 feet of him. Occasionally he would give us a stare down, but he really didn’t seem to be bothered by us much. It is fantastic to find one on a low pole where you are practically at eye-level. So here I am hand-holding monster lens and waiting for him to do something. I moved a bit closer and to the left. Wings up for the photogs! Finally, he pooped but I wont show you that. Lightening the load is usually a sign they are going to fly, and sure enough, he raised his wings. And held them up for … 29 shots. All in focus and hand-held. There were so many, but I liked the head angle on this one the best. He did a bit of scratching and then nonchalantly flew off … away from us, of course. None of the in-flight shots were keepers. Back on Crab Rd we found another Tricolor that was content to just stand and let us take his photo. He wasn’t interested in preening or fishing so we called it a day. We had some killer Osprey shots, lots of Tricolors and even a Green Heron! I noted I never used my tripod all day; just swapped the 300 f/4 and 500 f/4 lenses on my D850. I really really need a second body; you can miss some great shots if you are ill prepared. I know, First World Problem. Coming home we stopped at Whataburger for dinner and then at HEB to stock up on groceries for the cold days ahead. Stew and cornbread is just right for cold nights! Are you staying warm during this winter blast? Or do you just bundle up and get out there anyway? Let me know in the comments below.